It's been less than six months since Samsung pulled back the curtain on the eye-catching Galaxy S6 Edge, and now it's getting a very familiar-looking sibling. Say hello to the Galaxy S6 Edge+, a super-sized sequel that powers up the original formula with a larger screen, more RAM to help its multitasking prowess and... well, not a whole lot else. Oh, and before we go any further, you'll be able to pick one up from all five major US carriers starting on August 21st (update: we have pricing, see the end of the post). If you're looking for hardware differences between this and the newly announced Galaxy Note 5, you won't find many at all. The only major changes between the two are the shapes of those 5.7-inch, Quad HD, Super AMOLED screens (the S6 Edge+ has that lovely dual-edge display that curves away from you) and the fact that one has an S Pen and all the little software accoutrements that go with it. Seriously. As I've mentioned elsewhere, the actual hardware built into both phones is identical: an octa-core Exynos 7420 chipset with 4GB RAM, 16-megapixel rear cameras, 5-megapixel front-facing shooters, either 32GB or 64GB of storage and absolutely nothing in the way of expandable memory. And if you're looking for design differences between this thing and the original S6 Edge, you'll come up with a similarly short list. 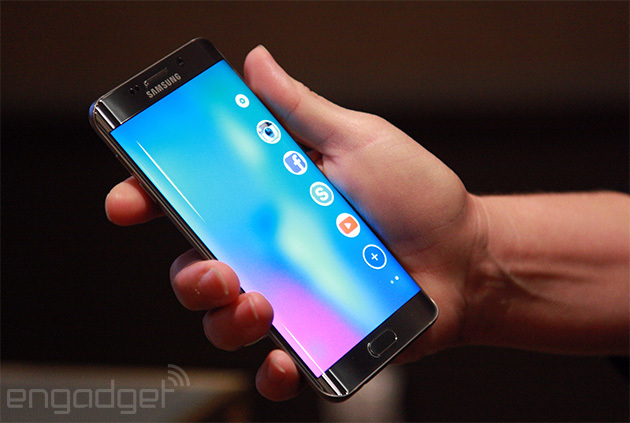 After all, what we've got here is just a big ol' Galaxy S6 Edge. What else did you expect? The glass-and-metal chassis feels sturdy and about as comfortable as the first one did, which is an accomplishment by itself given how much longer the Edge+ actually is. The screen is just as good, with those highly saturated AMOLED colors and great viewing angles, and you can see that 4GB of RAM put to good use when you rapidly bounce between all your running apps. There's no denying that the foundation that powers both new devices is a powerful one, so what we've really got to dig into is the software that sets them apart from each other. When I reviewed the original Edge, I (and plenty of others) lamented the lack of software that actually took advantage of that curvaceous screen. Samsung seems to have taken that griping to heart, and we're starting to see the Edge's software side begin to blossom. Remember People Edge? It was a little slider that lived right on the screen's edge, and a quick tap would bring up a list of favorite contacts you've chosen. Well, this time we've also got App Edge, which lets you set aside certain apps as favorites for quick access from the side of the screen too. Watching circular app icons slide into view is neat and all, but really -- you might as well just have all of them on a separate home screen pane if you were really concerned about shaving seconds off your daily grind. Rubbing one of the screen's curves while it's off still brings up a ticker with the news of the day, and it looks like Samsung's finally trying to flesh it out a little more with help from content partners like CNN, Yahoo and Twitter. Not exactly thrilling, huh? Well, it actually gets a little better. I'm told the company plans to launch an API so developers can create their own Edge-friendly experiences you can download down the road, sort of like you could with the Galaxy Note Edge last year. Developers who whipped up content for that even bigger phablet were bummed to discover none of their applets worked on the S6 Edge, and it seems awfully likely they'll have to start from scratch with the Edge+ too. This, in short, is great news. Samsung's own approach to the "What do we do with this screen?" problem was never all that exciting, so hopefully developers can cook up some reasons to get an Edge+ beyond just its looks. If I'm honest, the S6 Edge+ feels like the result of some gadget-y SAT logic problem. 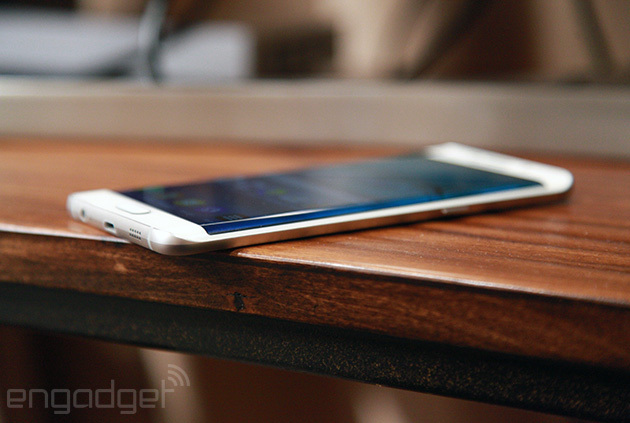 People like the Galaxy S6 Edge. People also like big phones. Therefore, people should like a big Galaxy S6 Edge, right? They probably will, if only for the thing's first-rate looks and its gorgeous (and huge) screen, but the Edge+ and its smaller cousin are both in dire need of truly cool experiences that are only possible on a curved display. Only time -- and a freshly shipped review unit -- will tell, so stick around for a deeper dive someday soon. Update: US carriers are spilling the beans on pricing, and the S6 Edge+ will be a bit more expensive than the Note 5 (those curved screens still don't come cheap). You'll usually pay $300 on contract for a 32GB edition, and $400 for its 64GB counterpart. That translates to a respective $27-30 or $30-35 on installments, and $792-815 or $888-915 when you pay full price. Update 3: Samsung has confirmed that the 128GB models were listed by mistake. Sorry, media fanatics.